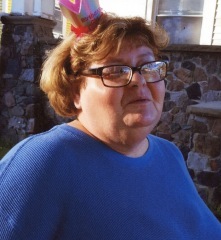 Suzanne "Sue" Richards, 56, Sandusky, died Monday, September 3, 2018, in Firelands Regional Medical Center, unexpectedly. She was born on October 13, 1961, in Point Pleasant, New Jersey, to the late Jacob "Jack" and Carol (Fitzgerald) Rosenman..
Sue is survived by her husband of 28 years, Walt Richards; son, Joe Richards; daughters, Kate (Nick) Ratliff, Attica, OH, Melissa (Josh) Stingel, Morenci, AZ; granddaughters, Kencaide Ratliff, Makenlee Ratliff, and Katherine Stingel; her mom, Kathy Mangano, Toms River, NJ; many brothers and sisters; a friend like a sister, Heather Pletcher; several nieces and nephews. She was preceded in death by her parents; and her father, Joey Mangano. Friends may call on Saturday, September 8, 2018, from 1 P.M. until time of funeral services at 3 P.M. at the Salvation Army, 3333 Columbus Ave., Sandusky. Kevin and Tracy Knappins will officiate. Memorial contributions may be made to the family in care of Toft Funeral Home & Crematory. Condolences may be made by visiting toftfuneralhome.com. Toft Funeral Home & Crematory, 2001 Columbus Ave., Sandusky is handling the arrangements.